Situated on the edge of Al Ain Oasis in the same complex as the Sultan Bin Zayed Fort (Eastern Fort), the Al Ain National Museum serves to showcase the unique heritage and ancient history of this region. Divided into three distinct sections – Archaeology, Ethnography, and Gifts – the museum's main themes explore the various aspects of UAE history and everyday life. The archaeology displays are particularly extensive, with artefacts dating back to the first millennium BC, including weapons, jewellery, pottery, and coins that were excavated from ancient tomb sites nearby. The ethnography galleries focus on the various aspects of the life of the Bedu desert dwellers, including exhibits on education, marriage, and farming, while the gift section refers to the gifts that Sheikh Zayed Bin Sultan Al Nahyan received throughout his lifetime. These include Bedouin jewellery, musical instruments, a silver dagger, and even a golden palm tree. The Al Ain National Museum is located next to the Sultan (or Eastern) Fort on the eastern side of the Al Ain Oasis. There is a bus from Al Ghubaiba Bus Station in Dubai to Al Ain Bus Station, which is a good spot for accessing the region’s historical sites. The journey time from Dubai is around two hours. Explore the picturesque city of Al Ain, the traditional seat of Emirati sheikhs, on this day trip from Dubai. Travel east through the desert toward the Omani border, and admire the rugged Hajar Mountains that frame Al Ain, probably the United Arab Emirates’ most traditional city. Discover the remnants of Bronze Age settlements at Al Ain Museum; and visit the Sheikh Zayed Palace Museum, camel racetrack and livestock market. Climb Jebel Hafeet, the craggy mountain that overlooks the city, visit its hot water springs, and enjoy a tasty buffet lunch. Experience the picturesque oasis town of Al Ain on a day trip from Abu Dhabi. On route to the ‘Garden City,’ see the rocky Hajar Mountains and learn about Al Ain’s history from an expert guide. Visit the Al Ain National Museum to uncover the city’s Bedouin heritage, and explore the Sheikh Zayed Palace Museum and bustling camel market. Admire the views of the palm-filled city from Jebel Hafeet mountain, dip your toes into the mountain's hot springs, and before returning to Abu Dhabi, enjoy a tasty buffet lunch. Discover the delightful, mountain-backed city of Al Ain on this full-day trip from Dubai. Called the Garden City for its lush parks, this picturesque city lies beneath the Hajar Mountains near the Oman border and offers up forts and attractions that recall a bygone age. 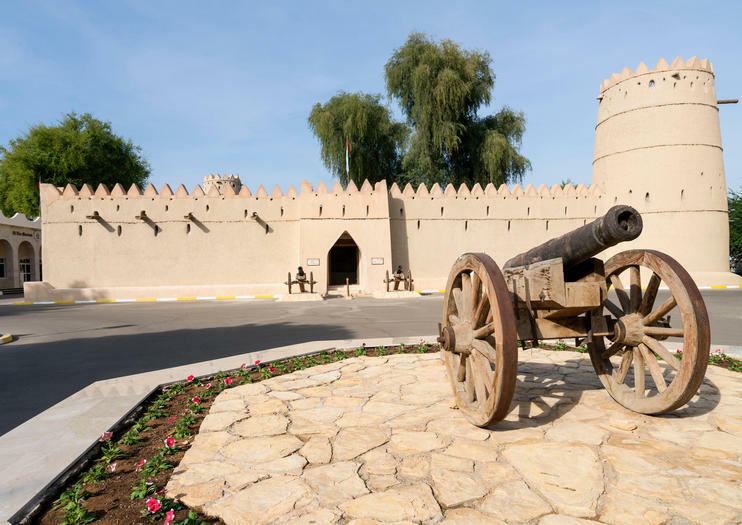 Explore two museums, the former royal palace and charming Al Jahili fort. Finish with stops at the warm springs, the camel market and the oasis to see the falaj (water channels) that irrigate the palms. Discover delightful Al Ain — known as the Garden City of the United Arab Emirates — on a day trip from Dubai. Enjoy the desert views as you journey toward the Hajar Mountains near the Oman border. Explore Al Ain Museum to uncover the city’s Bronze Age roots, visit the camel market and zoo, home to prized white tigers; and experience the hot springs and stunning views from Jebel Hafeet, the country’s highest peak. Finish with a delicious buffet lunch at the Al Ain Hilton. Numbers are limited for a small-group experience. Explore Al Ain, the UAE’s ‘Garden City,’ on a full-day trip from Dubai. Leave Dubai’s skyscrapers behind, and travel to Al Ain, famous for its gardens, date palm oases, and encircling Hajar Mountains. See Bronze Age ruins at Hili Archaeological Park, visit Al Jahili Fort and Al Ain Camel Market, climb Jebel Hafeet, the UAE’s highest peak, and dip your feet into Al Ain's hot springs. Round-trip air-conditioned transport and hotel pickup and drop-off included. Spend the day exploring the highlights of the historic desert city of A Ain. Begin with a stop at the Hili Archeological Park, with Iron and Bronze Age history. Pass through the fortified Sheik Palace Museum, then walk along the shaded pathways of the Al Ain oasis. See the Al Ain National Museum, the camel market, and the hot springs at Green Mubazarrah before returning to Dubai. Experience a different United Arab Emirates on a private day trip from Dubai to Al Ain, nicknamed the Garden City. Leave futuristic Dubai and cross the desert to the city, ringed by the Hajar Mountains. Alongside your personal guide, explore Al Ain’s royal history at the Sheikh Zayed Palace; discover its ancient origins at the Hili Archaeological Park and Al Ain Museum; and visit the camel market and an oasis, honeycombed with traditional ‘falaj’ irrigation channels. Enjoy an optional lunch and admire the splendid views from nearby Jebel Hafeet mountain. The Abu Dhabi city of Al Ain is a UNESCO World Heritage site and one of the world's oldest permanently inhabited settlements. On this tour, travel in the comfort of a private vehicle and enjoy the undivided attention of a private guide. On arrival, explore the historic Al Jahili Fort, learn more about local history and heritage at the Al Ain National Museum, and admire the views from Jabal Hafeet mountain. Story at the edge of the Empty Quarter, of an oasis surrounded by the desert dunes and on the side of Jabal Hafeet. Alain, the green city, features more than 14700 palm trees on a form of oases scattered across the ancient town. Hence, the city has been inhabited since 4000 BC, as shown through agrological sites in some part of town. Moreover, and during your tour, our Emeriti guides will take you to Alain Palace, showing the traditional sheiks residential. Moreover, you will not miss the camels market, as well as jabal Hafeet, to see the panoramic view of the city.